Michelle Spark was born in Philadelphia, Pa. She studied painting at the University of Pennsylvania Graduate School of Fine Arts and Queens College. After completing a master’s degree in Art Therapy at New York University, she also taught there and worked in a large metropolitan New York hospital for many years. 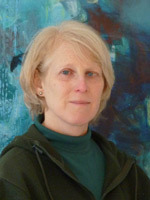 Currently, she devotes all her time to painting, Zen practice, and local watershed concerns. After living in New York City, for twenty five years, Michelle Spark moved her studio, to Phoenicia, NY, on the Esopus Creek, in the heart of the Catskill Mountain Forest. "Esopus Creek is always there, flowing onwards, clay based, cobble bars, rounded river rocks, white water, trout leaping, (even kayackers, and distubers), minks swimming, deer crossing, bear fishing, always, flowing coming, going, never still. "Here, I'm taking in what’s what outside."